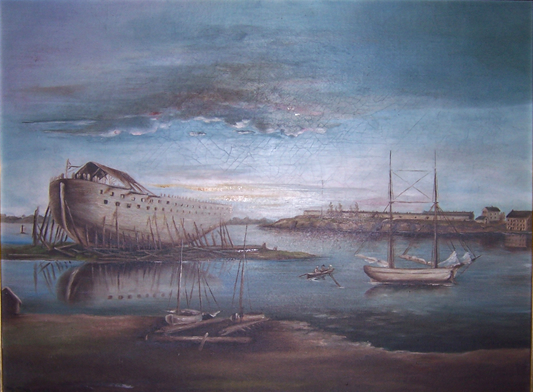 Painting of the harbor at Sackets, depicting the weathered hull of the War of 1812-era ship-of-the-line New Orleans, built in 1815, but never sailed; the miltary encampment Madison Barracks, built in 1817, can be seen on the opposite shoreline, as can Elisha Camp's three-story mill house, built in 1813, both of which are still standing. 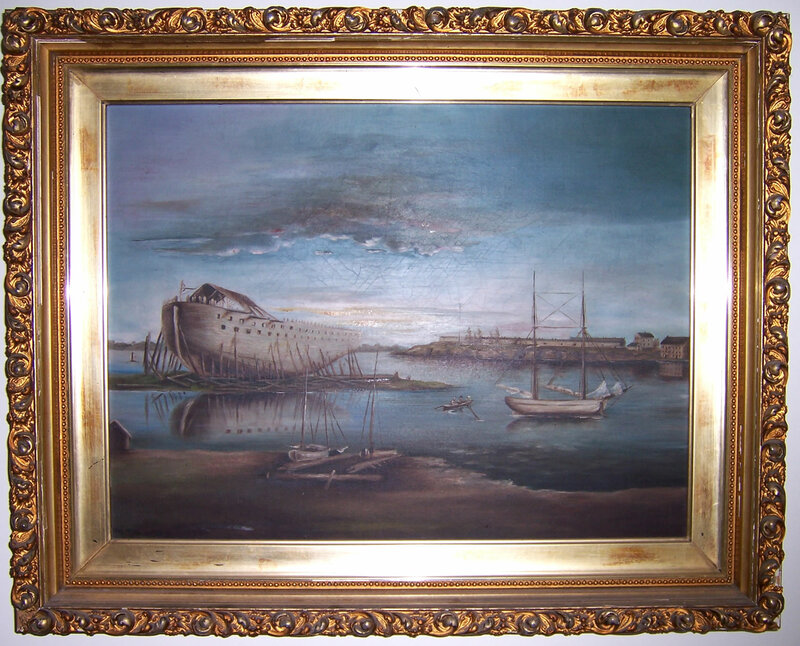 This painting hangs in the Augustus Sacket Mansion on West Main St. in Sackets Harbor, which today functions as a visitor center for the village and overlooks the site of the subject of this painting. Veterans in Jefferson County: data from a variety of sources, includes veterans living or buried in Hounsfield -- look for a name in the alphabetical list, or search the page for the terms Hounsfield, SACKETS H, MUSCALONGE, MUSCALUNGE, MUSK CEM, or SULPHER SPRINGS, at Jefferson County GenWeb. 1840 Census of Pensioners, at Jefferson County GenWeb. 1813 Map of "Operations at Sackett's Harbor": depicting village defenses and movements of British invasion forces, from Lossing's fieldbook. 1814 Map of Sackets Harbor: showing military defenses and U.S. Navy fleet deployments, from Lossing's fieldbook. Battles of Sackett's Harbor: Soldiers, Officers & Descendants: a place to learn more about your ancestors and to connect with other researchers, contributed by Mark A. Wentling. Capt. Elisha Camp's Company of Artillery, New York Militia: roster of men who participated in the first battle at Sacket's Harbor on 19 July 1812, includes signatures of each person! 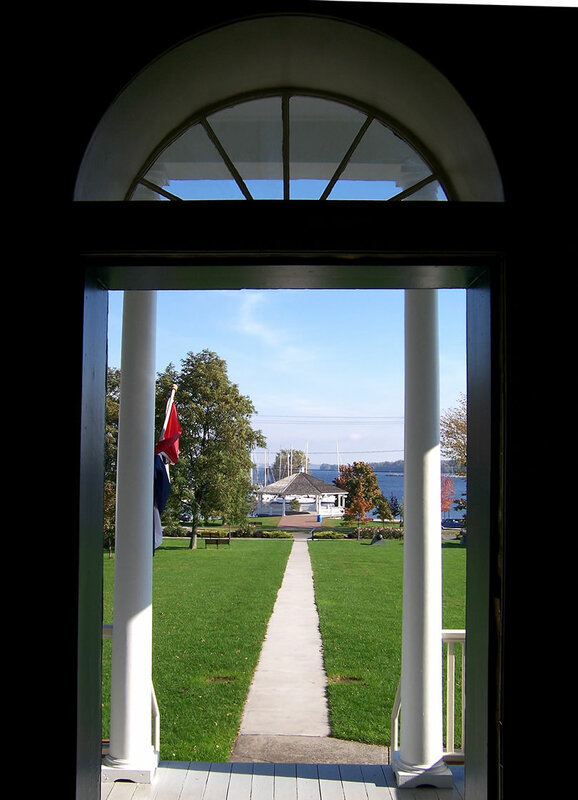 The First Battle of Sackets Harbor: Franklin B. Hough's 1854 account of the first conflict of the War of 1812 in U.S. territory, contributed by Mark A. Wentling. New Orleans, (1815-1884): a War of 1812 ship-of-the-line at Navy Point, contributed by Mark A. Wentling. The Brig Oneida: (downloadable text file, 45KB) roster of over 500 officers and crewmen who served at Sackets Harbor aboard this vessel from 1811 to 1813, some of whom played an instrumental role in repelling the first British attack on Sackets Harbor on 19 July 1812; transcribed from the rosters at the National Archives and generously donated by Kurt Laidlaw. Index to 1865 Town Clerk's Census of Civil War Soldiers from Hounsfield: linked to transcriptions of the actual records hosted at Jefferson County GenWeb. Civil War Veteran Deaths from the 1865 State Census: reproduced with permission from Sheila Hoffman. Soldiers Buried in Hounsfield, at Jefferson County GenWeb. Veterans Enumerated in the 1890 Census, at Jefferson County GenWeb. G.A.R. Joseph K. Barnes Post No. 360: programme for observance of Decoration Day 1906 in Sackets Harbor, contributed by Mark A. Wentling. Roster of Veterans from Hounsfield and Sackets Harbor: taken from the memorial entitled "Jefferson County in the World War," compiled by George Reeves in 1920, contributed by Mark A. Wentling. Madison Barracks, 1940-1942: memories of school and work during WWII at the local military post, contributed by Florence Secor. 1895 Map of Madison Barracks: from Haddock's History of Jefferson County. Madison Barracks Residential Community: oldest military installation in the county, established in 1817 and now a resort and residential community.